Single posterior approach surgery to correct spinal curve. Wimberly was in her thirties when she began experiencing buttock pain on her left side. While her symptoms were mild at first, the pain worsened and became persistent. Her general practitioner’s diagnosis was progressive adult scoliosis with a bone spur restricting a nerve. Even so, Wimberly continued to stay as active as possible. Some of her favorite activities include traveling with her husband and painting. To help manage the symptoms associated with her adult scoliosis, Wimberly went to a number of nonsurgical specialists over the years. She tried chiropractic care, massage therapy and injection treatment. Fortunately, WImberly was able to schedule her injections before she traveled and this allowed her to remain active during the trips. After a time, the injections stopped relieving pain and Wimberly found it more difficult to maintain an active lifestyle. Sitting, standing, and walking all provoked pain and her leg was weak. Wimberly even had trouble sleeping. All in all, the symptoms left her feeling quite disabled. “I remember thinking even if it meant using a wheelchair, I knew something had to be done to relieve the pain. It was too much to bear,” she says. 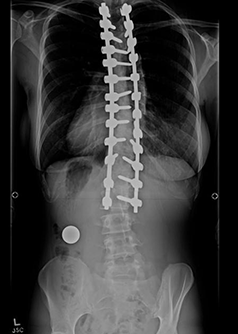 Wimberly went to see many spine surgeons for her adult scoliosis, unfortunately the complexity of her condition was outside the realm of their specialty. 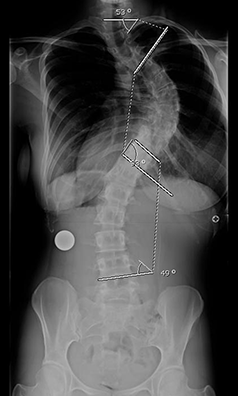 At last, she was referred to dual Fellowship-trained scoliosis and spine surgeon, Dr. Matthew Geck at Scoliosis Texas who focuses his practice on complex pediatric and adult scoliosis. He explained that she had a progressive and degenerative spinal curve. This caused bone spurs to impinge on nerves and result in pain. Since she had exhausted conservative options, Dr. Geck explained her other options, one of which was surgery. While Wimberly was nervous about surgery, she knew she couldn’t continue to live with the pain and wanted to get back to her active life. Dr. Geck would perform the surgery in a single operative session through a single posterior approach — this is one of the reasons Wimberly chose Dr. Geck. Another surgeon had recommended a more invasive anterior and posterior approach surgery. Dr. Geck performed Wimberly’s surgery in 2011. She was pleased to wake up after surgery with her nerve pain relieved and leg strength improved. Today, three years after surgery, Wimberly has minimal pain and her walking is unlimited. 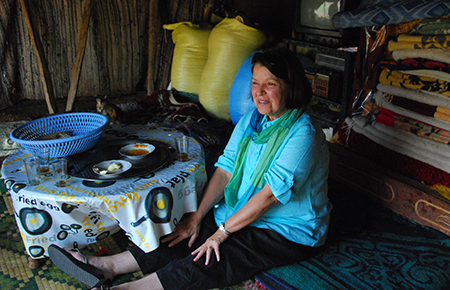 Since her surgery, she has enjoyed traveling to destinations such as Nepal, Bhutan and Morocco — without pain. Wimberly has enjoyed camel back riding and white water rafting. “Travel and pain-free daily living are possible for me today thanks to Dr. Geck and Scoliosis Texas,” she reflects.